"I'm completely in shock at how fast I've seen my body change!" My progress pictures are 14 weeks into Thinner Leaner Stronger. I started off the program cutting at 1500 calories and lost 5 lbs within 4 weeks. 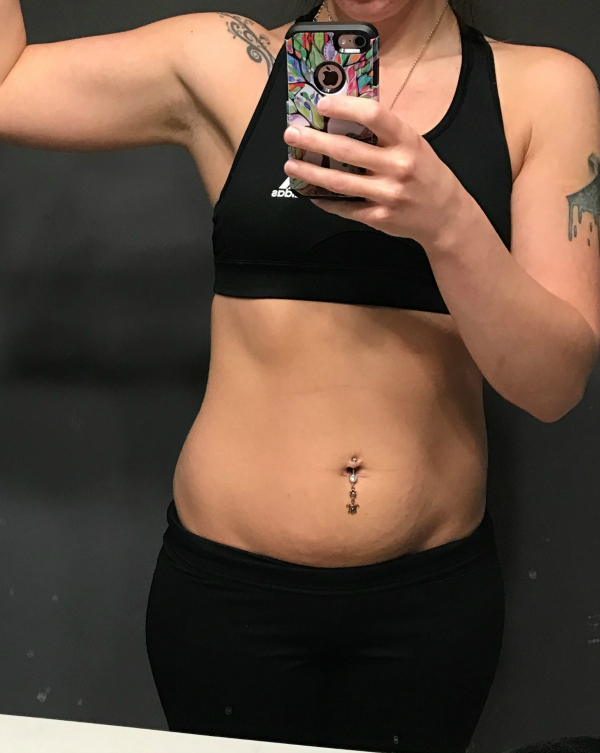 As I started to lose the weight, though, I noticed I had very little muscle definition, so I then upped my calories to maintenance, which is about 1700 calories a day for me. I’ve been eating at this intake now for ten weeks and have dropped down to 130.2 lbs. My strength has progressed on every compound lift. My squats went from not even doing the bar–I could only do goblet squats with 25 lbs–and last week I hit a personal record of 95 x 4 x 3. I didn’t do bench press for the first 4 weeks of the program either because I was scared of building a chest when my chest is already small, but I decided I should incorporate it for overall strength. I started benching just the bar and now I’m up to 75 x 4 x 3. The deadlift was my hardest lift. 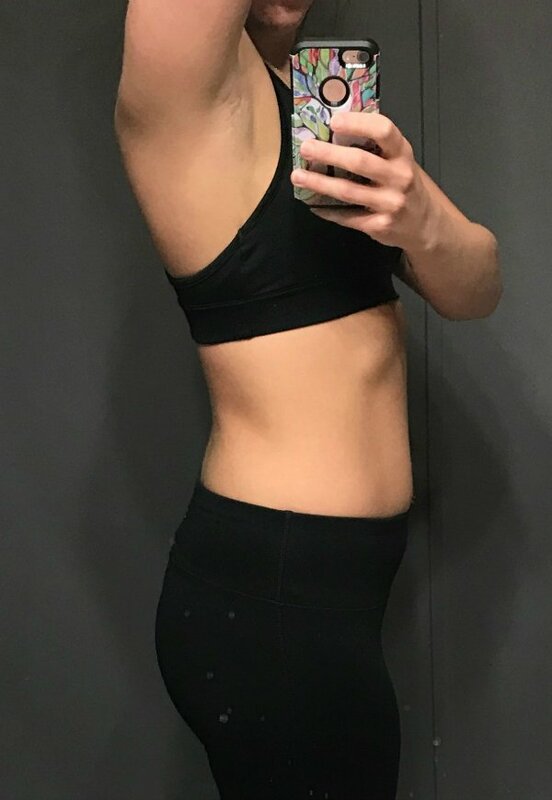 In the beginning, I started with 65 lbs and I’m now up to 115 x 4 x 3. Lastly, the military press is probably my favorite and easiest to do. I started with 15 lbs and I’m up to 55 x 6 x 3. I’ve incorporated cardio here and there but don’t really put much emphasis on it. I used the 5-day split and worked out Sunday, Tuesday, Wednesday, Thursday, and Saturday. I also added accessory work in addition to what is listed in the book. Honestly, I found muscleforlife.com and the books and immediately purchased them. Something about the way Mike explains things and his knowledge really got me eager to try something I’ve never done before. THE RESULTS! I’m completely in shock at how fast I’ve seen my body change. I never thought I’d be a girl lifting weights. I’ve had friends in bikini competitions and, honestly, that’s not the look I was striving for, so lifting weights scared me off for a long time. However, from reading the book and actually understanding everything, I have come to know now that I can make my body look the way I want and not “look like a man” as many people–including me–thought. I never in a million years thought I would love this change so much that I would want it to become something I’d want to make a career out of. I used to track calories with MyFitnessPal and didn’t know what I was doing, so I was eating at 1200 calories according to their calculations–granted I wasn’t working out at that time, but it still didn’t give me any results. I now know what to eat and how much to eat. The workouts are awesome–I love it! To be honest, I didn’t even know about compound lifts until I read this book. My first time at a gym, I just stuck to the treadmill–not on any program–and didn’t know the first thing about fitness. I’m so confident and happy in my own skin for the first time in 10 years. I have more energy–granted I have kids who take up most of that–but I feel like I can run and jump around with them and not feel like I’m gonna die! Doing this program has absolutely changed my life and thinking, and I can say that I will be in this for the long-haul. I would recommend this program to anyone because it’s straightforward and there are no gimmicks. You do the work and you see the results. It doesn’t cost thousands of dollars to pick up the book, read it, and put it into action. Just from looking at my progress and the progress of others, the program speaks for itself. Don’t wait! Don’t make excuses! Get the knowledge from the book and use the program and I guarantee you’ll be addicted and want to continue it. If you put in the work, it will show. 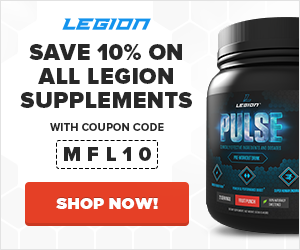 I do not use LEGION supplements as of now, but I plan on trying some out really soon. I didn’t know about how good they actually were until further in the program and following the pages on Facebook and Instagram.